The RB-MTV1 Contribution Voiceover Monitor with Talkback. The RB-MTV1 contribution voiceover monitor is a 1U rack-mount designed to be used in voice-over booths, news booths, commentary locations, for continuity announcements and for any other similar applications where voice needs to be added to programme content and then monitored. Programme feeds, auxiliary feeds and a talkback feed can be taken and monitored. The RB-MTV1 has four inputs and two outputs. It has a mono microphone input on XLR with switched coarse gain and variable fine gain control using a multi-turn preset potentiometer to give an overall gain range from +20dB to +80dB. There is also a switched LF rumble filter, switched +48V phantom power and switched level limiting control. A rear-panel multi-turn preset potentiometer allows adjustment of the threshold at which the limiter begins to operate, from -8dBu to +26dBu. There is an indication of the limiter activity using a blue LED and the microphone level is monitored by a simple 5 LED meter. The meter can be configured to either show the MIC signal activity in normal operation, i.e. when TALK is pressed the meter is off, or the meters can permanently show the MIC activity even when the TALK button is on or the MIC button is off. There is a mono balanced TALKBACK input on XLR. There are two balanced XLR stereo inputs, CUE and programme (PGM) each with a 10dB input gain switch to facilitate the use of unbalanced sources such as from PC audio cards, domestic CD players, etc. Each of these inputs, MIC, TALKBACK, CUE and PGM can be mixed and monitored in the front and rear headphone outputs with individual volume controls. Which of the inputs is presented to the headphone outputs can be configured using two banks of DIPswitches on the underside of the unit, one bank for audio that is heard in the left ear piece and one bank for audio monitored in the right ear piece. For example, the left and right PGM inputs can be sent to the right ear-piece and all other signals to the left ear-piece, or the TALK signal could be sent to the right ear-piece and all other signals to both ear-pieces. In this way, you can configure the unit for your particular application on installation. If a presenter doesn’t like to hear themselves in their headphones when using the TALK button, there is also a DIPswitch option to mute the mic signal to the headphones. There are two mono balanced outputs. The processed microphone signal is fed to the two outputs when the latching front panel MIC button is active - the button illuminates when active. The two main outputs can be independently switched to be at ‘Line’ or ‘Mic’ level outputs using rear panel push switches. 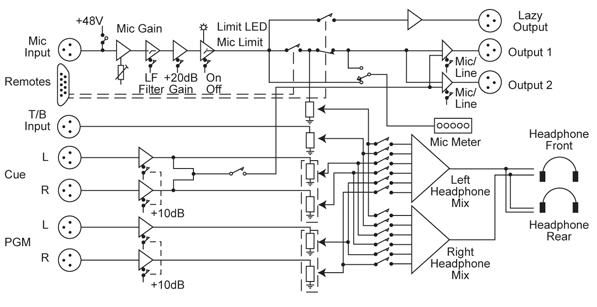 Setting the output to a microphone level allows the unit to be inserted into the microphone channel of a mixer. There is an option to permanently enable the MIC button, even when remotely controlled, for occasions when you always want the MIC channel left open. Additionally, there is an option to mix the CUE input as a mono feed to the outputs permanently. The front panel TALK button is a momentary push switch that routes the processed microphone signal to the “LAZY” TALK output, whilst disconnecting it from the main outputs, allowing the operator to talk to a colleague. This enables the unit to be used as a talkback intercom between two or more studios. There is a rear panel remotes connector giving remote control of the two front panel MIC and TALK buttons and opto-isolated tallies of their status. A red LED on the front panel of the unit indicates when power is present. Input Impedance: 2kΩ nominal balanced MIC input	>20kΩ all other inputs.